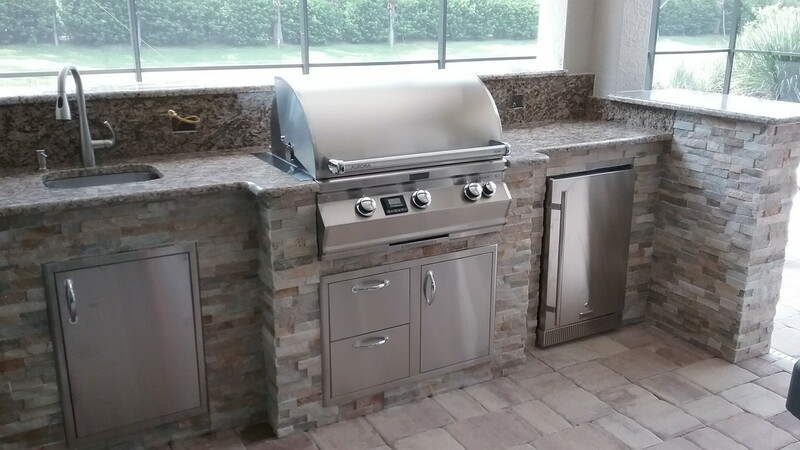 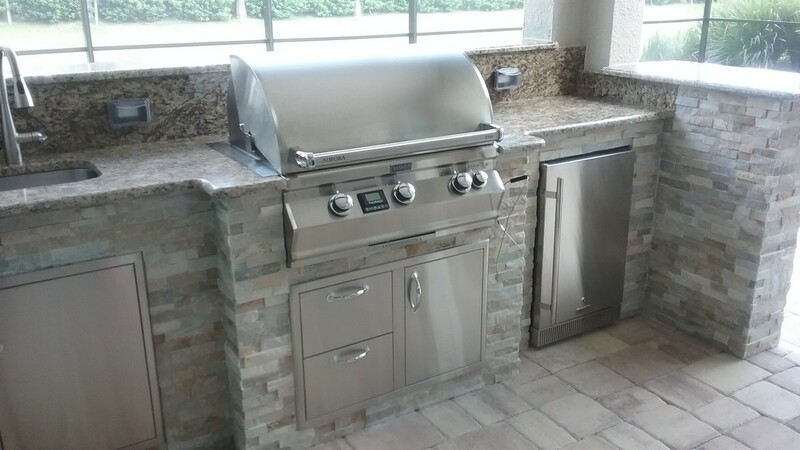 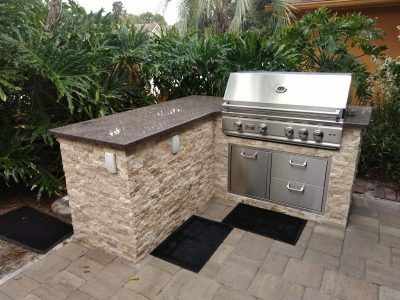 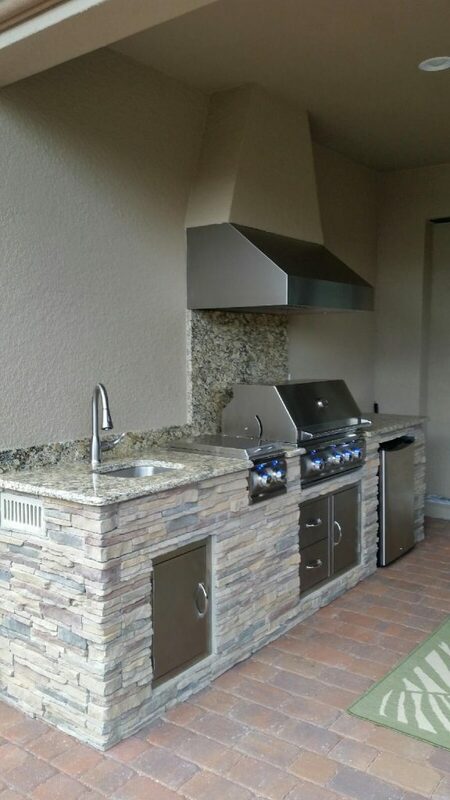 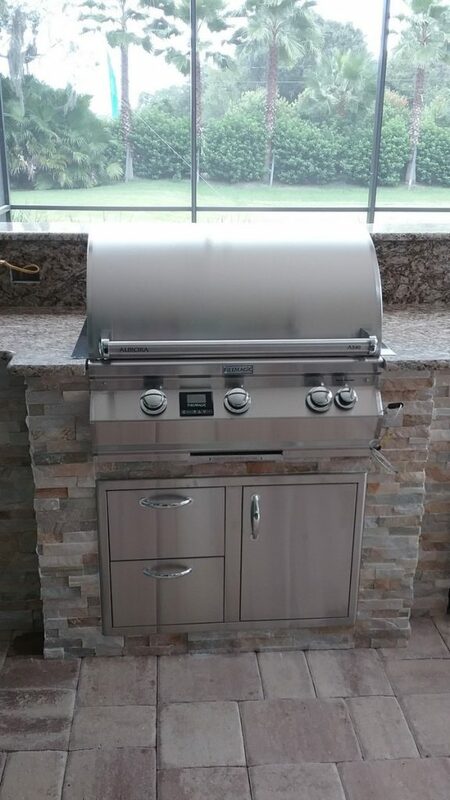 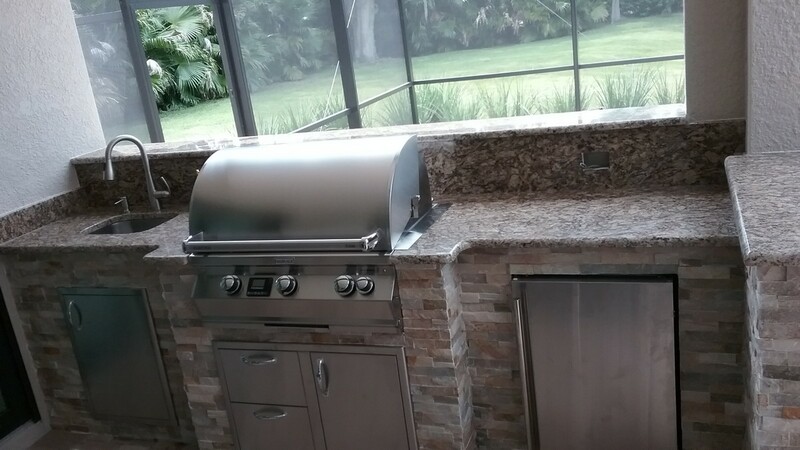 This outdoor grilling area in Sarasota features a freestanding design, complete with a 38″ Summerset grill and PCM 36″ doors/propane slide. 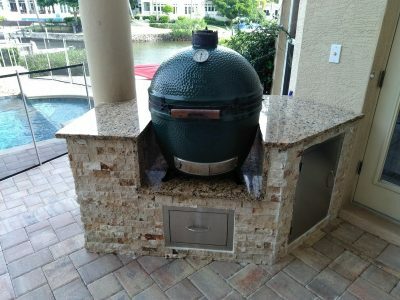 For this project, we built a custom kitchen to house the customer’s Big Green Egg smoker. 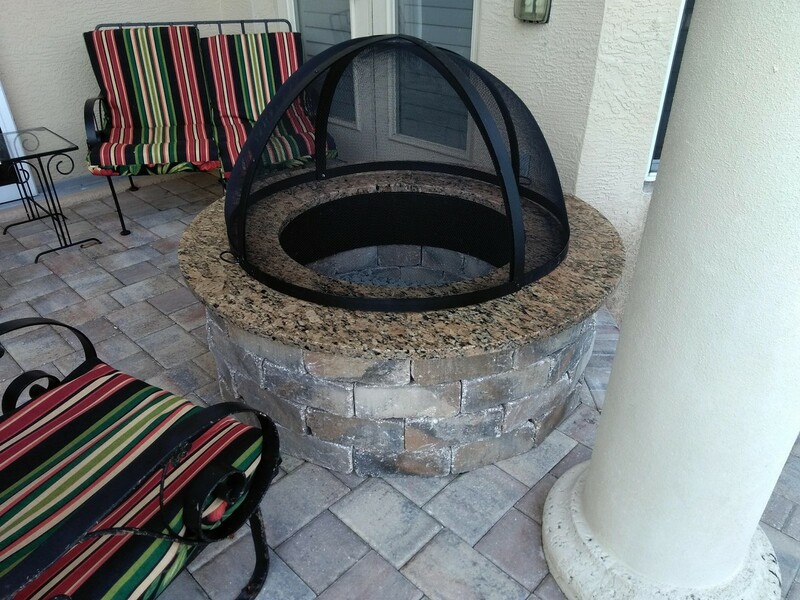 We also made a custom firepit with a granite top. 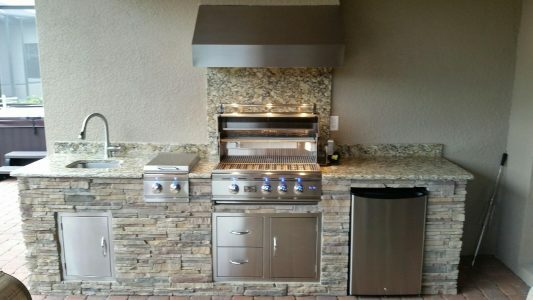 This outdoor kitchen in Sarasota’s Sandhill Preserve comes complete with a Summerset TRL grill, a double side burner, trash pull out drawer, utility drawer and a custom stone hoodvent extension. 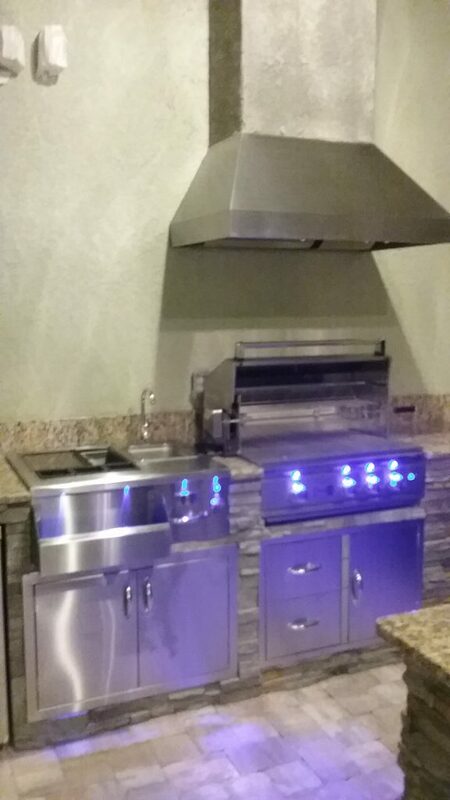 This project features a FireMagic Aurora grill with digital thermostat, Blaze doors/drawers and fridge. We set the appliances in a custom frame covered in beautiful stonework, topped with granite. 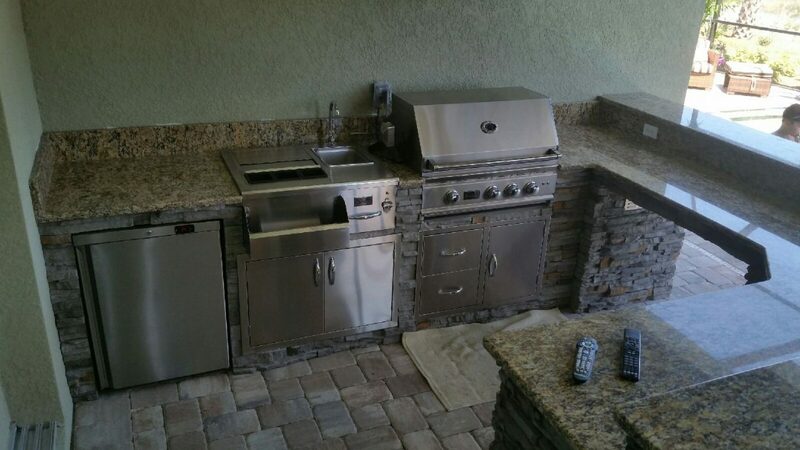 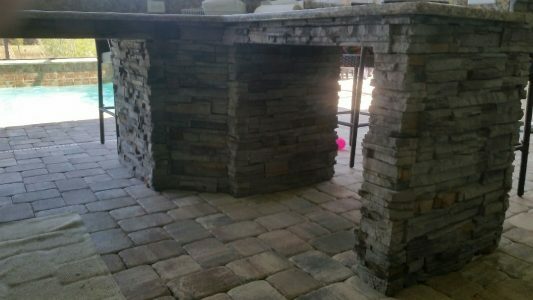 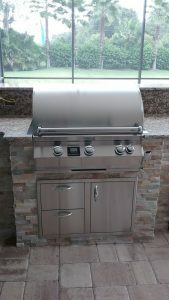 We designed this outdoor kitchen for a customer who wanted to complete their outdoor entertaining area. 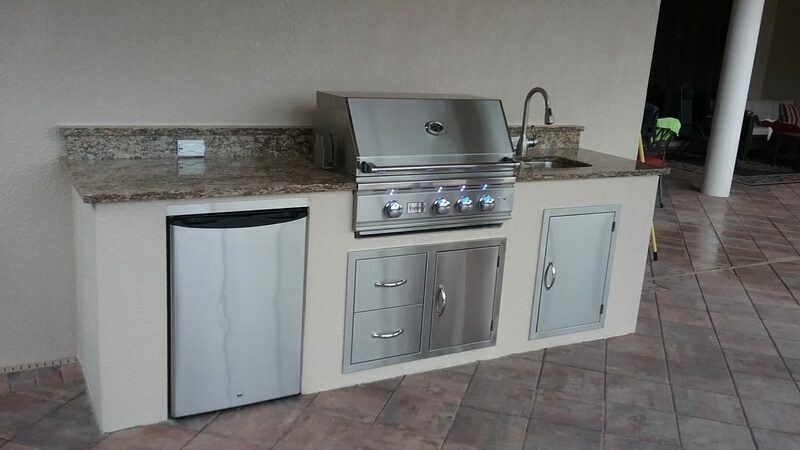 The TRL 32” grill Is the centerpiece of the set of appliances and accessories by Summerset, which also includes a stainless steel mini-fridge, doors and drawers to access storage and plumbing fixtures and an undermount sink. 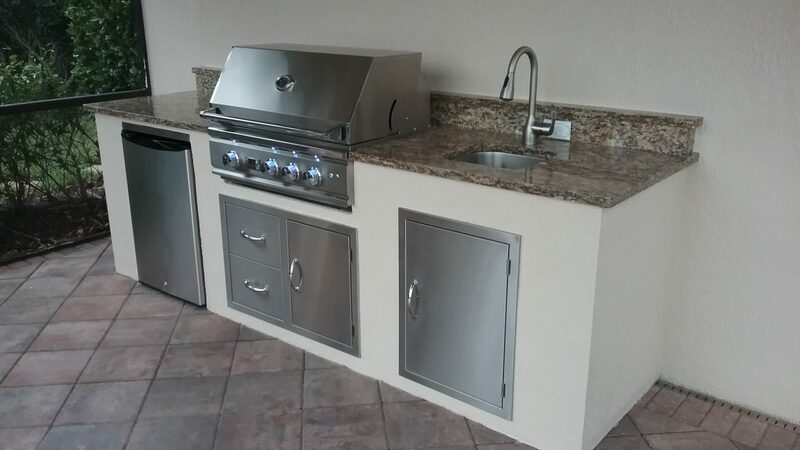 We built a frame to accommodate the appliances and fit the available space, like we do for all of our custom backyard kitchens. The stucco finish we applied integrates seamlessly with the existing stucco on the walls. 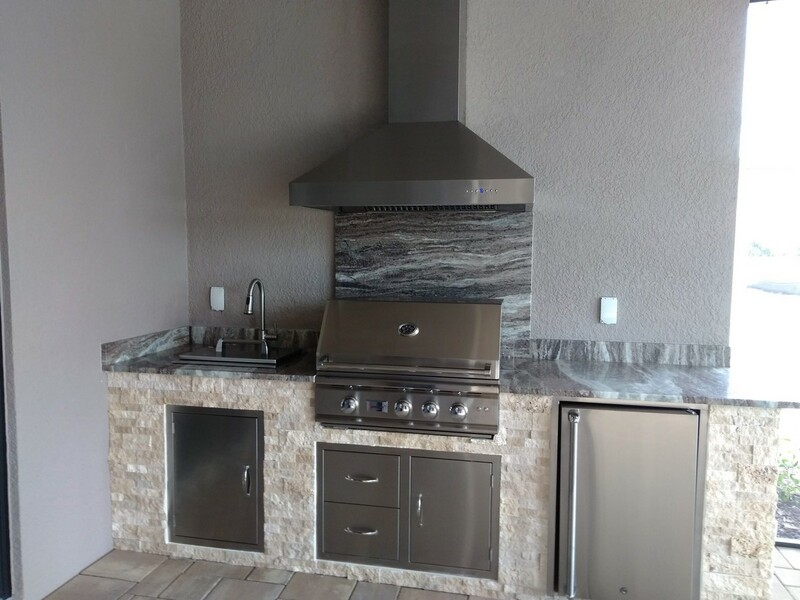 The finishing touch is the granite countertops and backsplash – with a shelf at the top to make the most of the space. 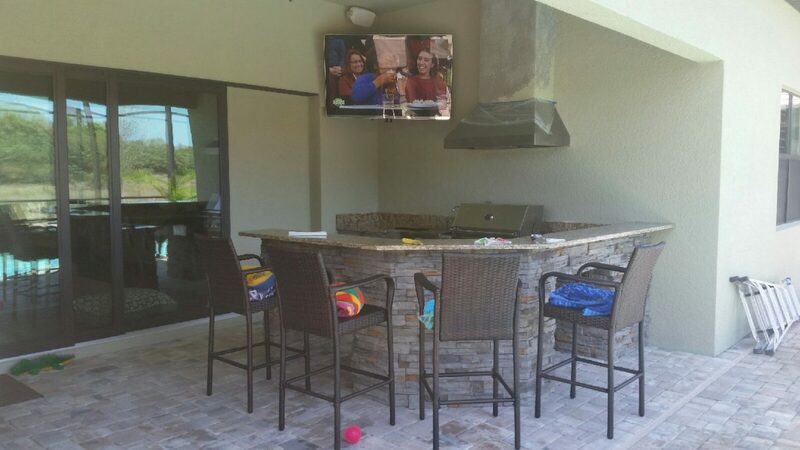 These Sarasota homeowners wanted an not just a place to barbecue, but a whole outdoor entertaining area with a flat-screen TV and a bar with plenty of seating for visiting grandkids. 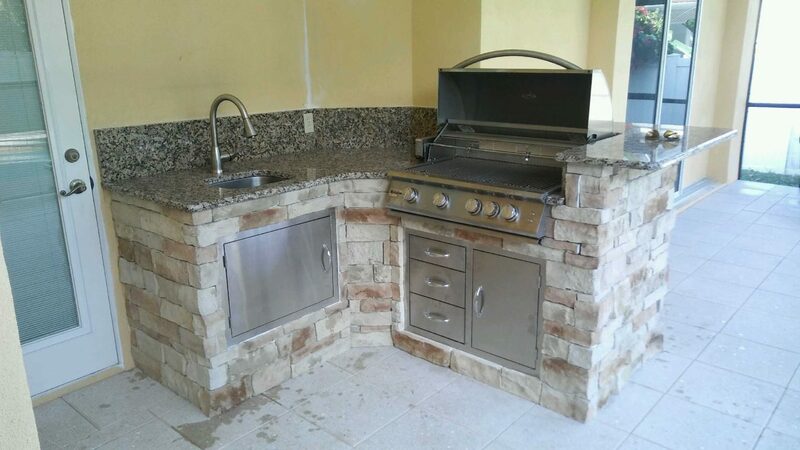 We delivered with this unique U-shaped design, complete with cast concrete stonework and granite countertops. The appliances and accessories include a Summerset grill, ice chest, outdoor rated fridge, double-door plumbing access beneath the sink, and a door/drawer combo beneath the grill for storage and access to the natural gas line. 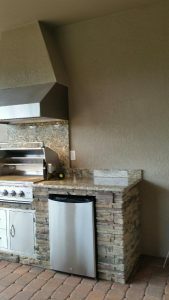 We created a custom extension for the Euro-style hood vent by Vent A Hood, which we covered with stucco to make it blend seamlessly into the wall. 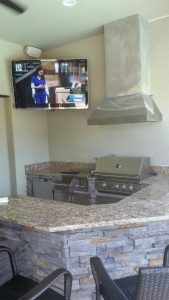 We even created a custom mount for the TV, placing it at the perfect angle to watch while relaxing at the bar. 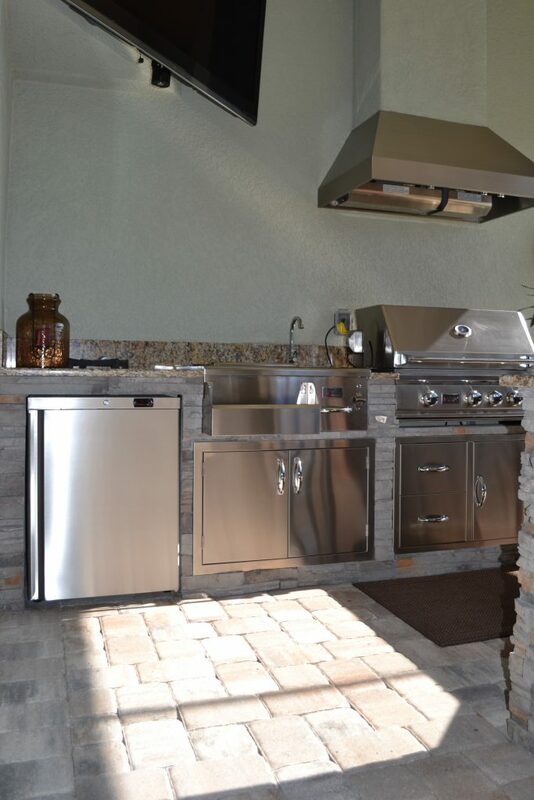 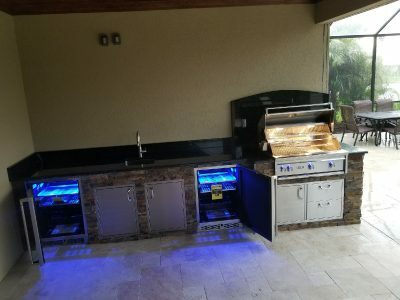 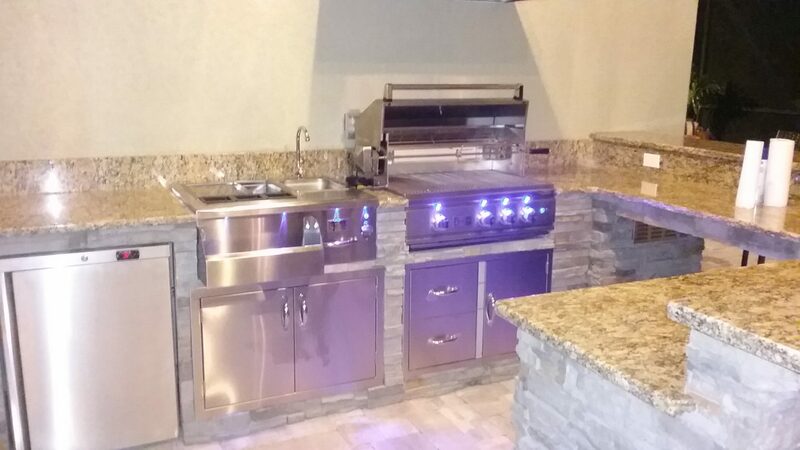 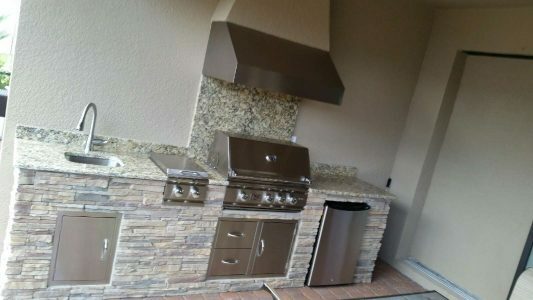 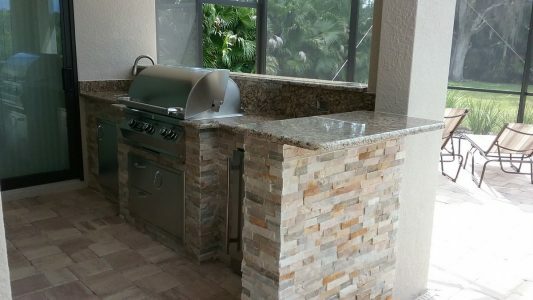 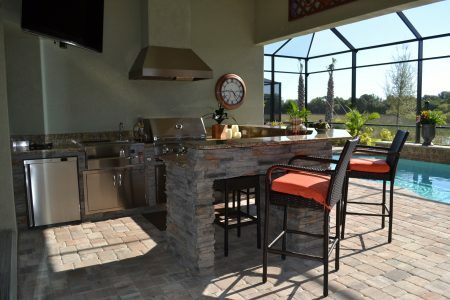 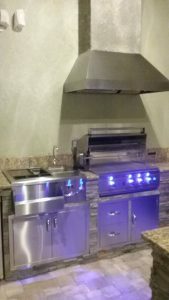 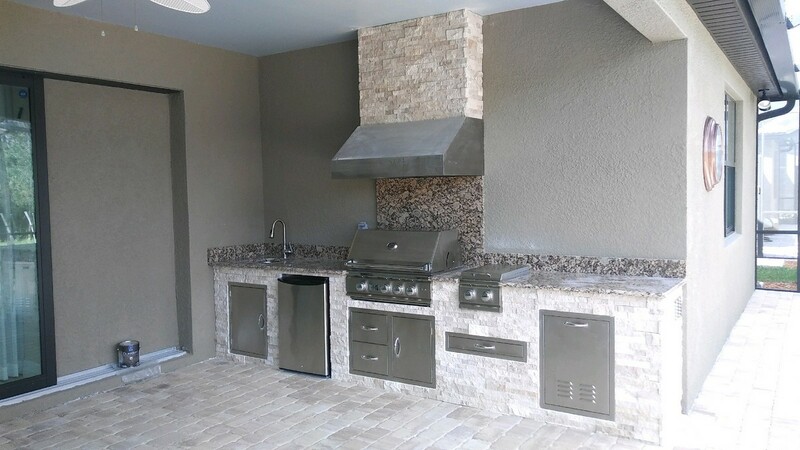 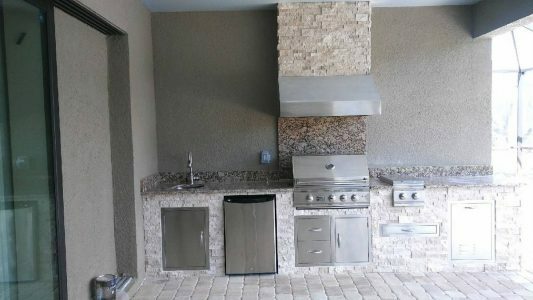 These customers are neighbors of the previous Sarasota homeowners, who wanted an outdoor kitchen to for their own home in Sarasota’s Sandhill Preserve. The location for the kitchen was a natural choice, being that it was pre-plumbed and pre-wired for electricity. 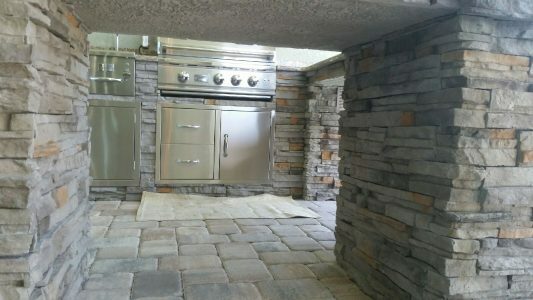 It was also the only large enough section of wall under the covered part of the lanai. 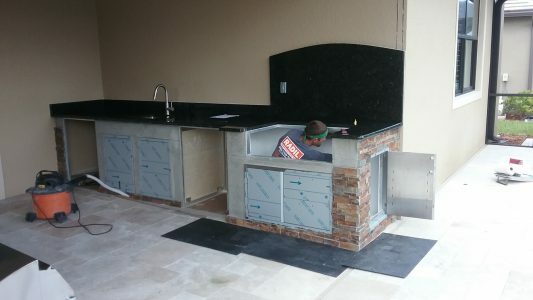 We created a custom frame covered in cast concrete stone, with a granite countertop and backsplash that connects seamlessly with the hood vent by Vent A Hood. We custom-made and stuccoed an extension for the hood vent, just like we did in their neighbor’s outdoor kitchen. 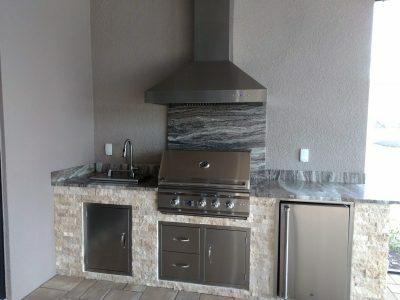 The appliances are all made by Summerset, including the TRL 32” grill, the double side burner, mini fridge, and the access doors and drawers. This kitchen belongs to yet another Sandhill Preserve resident. We created a layout for them which included top-of-the-line appliances by Lynx – including a Pro series 36″ Grill and not one, but two Pro series refrigerators – as well as access doors and combos by Kingsford. 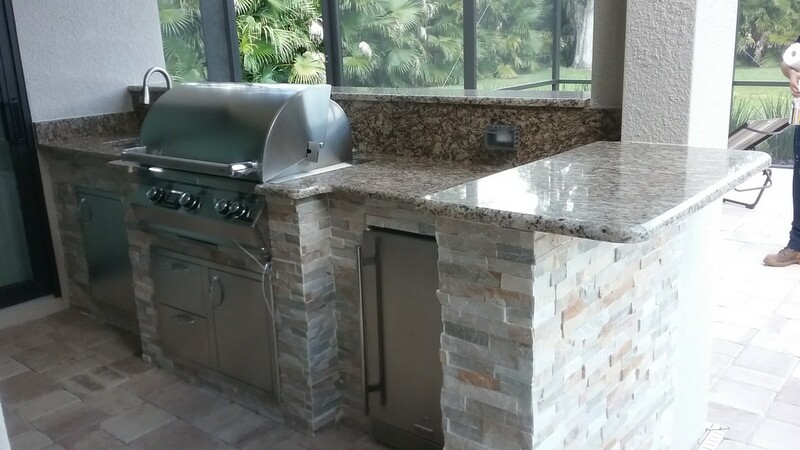 The frame’s natural stone facade matches the pool on this newly-constructed Sarasota home. The design also features granite countertops and custom underside cabinetry. 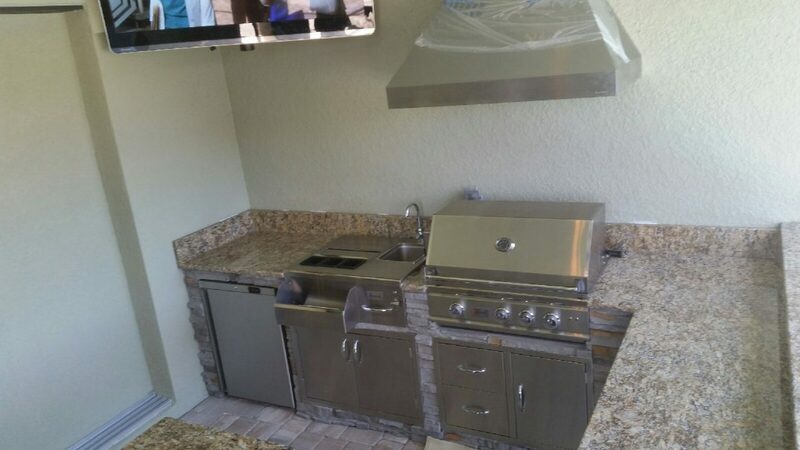 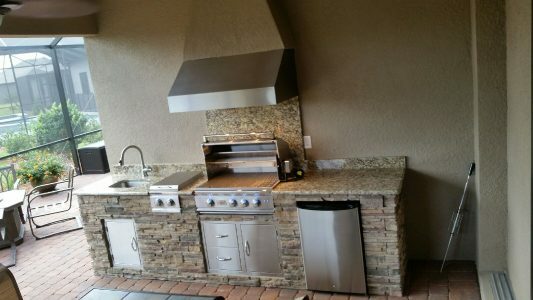 These homeowners had an existing outdoor kitchen that they wanted replaced. So, after ripping out the old appliances and materials, we built an entirely new frame in its place. The new corner kitchen features a Sizzler grill by Summerset, an undermount sink, and doors and drawers for access to plumbing and gas as well as storage.